The morning of August 16, 2010, started out as any other morning. I woke up and got ready for work then stopped to give my husband, Jeff, a hug and kiss. A typical morning routine that we never missed — one that put a smile on my face as I rushed out the door to work. I realized something was wrong that morning when I called him to join me for lunch. His voice was different. I rushed home to find my husband curled up in pain and scared for his life. After rushing him to the hospital, I learned that he had suffered from a brain aneurysm, and I had to say goodbye to my husband, my best friend, and the man who taught me what it was like to truly love and be loved. As the day moved on, decisions had to be made. There was no question in my mind that Jeff would want to be an organ donor. When I realized that he wasn’t going to make it, my first call was to his best friend, Jerry. You see, Jerry was on the transplant waiting list for a kidney. Jeff and Jerry used to work together at Toyota of Des Moines. They had a ton in common, and I hit it off right away with Jerry’s wife, Anna. They were great friends of ours, and it was very hard for us to see Jerry so sick. 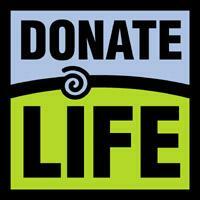 Anna and Jerry’s situation prompted Jeff and me to discuss our end-of-life plans and the importance of organ donation. I’m thankful we did because when I was faced with the decision, I knew exactly what Jeff would want me to do. I’m pretty sure the nurses in the ICU at Mercy thought I was crazy because as soon as I found out that Jeff wasn’t going to make it, I started bugging them to send someone from the Iowa Donor Network to talk to me. I knew I didn’t want to lose the opportunity to save another person’s life — especially if there was any way that Jeff’s kidney was a match for Jerry. A day later, Jerry had transplant surgery to receive Jeff’s kidney. There are many things about Jeff that I miss. We loved riding motorcycles, gardening and watching the History Channel. We shared a passion for all things music; he had amazing talent, and I loved to listen to and watch him create. I am blessed in that I can always go back and find comfort in the music he wrote. I’ve also formed a strong bond with Anna and Jerry. Watching how they’ve thrived since the transplant has been wonderful for me. They have loving children and grandchildren that light up their lives and bring meaning to my loss. I am so proud that Jeff felt so strongly about being a donor. Even though his passing was traumatic and sudden, his legacy continues in the gift of life he gave to many people. To see Tori in the Power of Yes video series, click here.